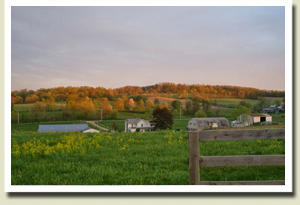 Scenic Ridge is a large farmhouse perched on a rolling hill overlooking an Amish community in the Mohican Valley area. The views from the house are outstanding! The rising sun is seen from the rear upper deck and the setting sun from the vast front porch. The area is a photographer’s dream. The night sky is brilliant. Sheep are often seen grazing on the hills across from the house and horses graze in the pastures bordering the property. Sitting on the front porch one can hear the clip-clop of horses as an Amish buggy drives by. It is a tranquil, serene, haven tucked into the countryside. Relax on the porches or at the campfire. It’s perfect for a get away vacation or a family/corporate event. 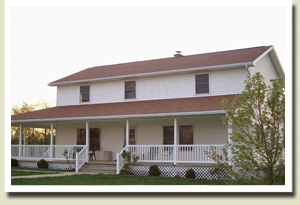 The seven bedroom Amish built house sleeps up to 14 and is rented to one family/group at a time. Unlike a bed and breakfast where you share common space – the entire house is yours! Whether it’s visiting Amish communities, hiking, fishing, skiing, canoeing or horseback riding Scenic Ridge offers a wide variety of things to do (See Attractions). Mohican State Park maintains horse trails but offers no boarding. Bring your trailer and park at the house. 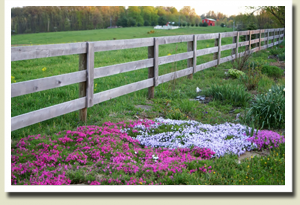 Scenic Ridge has a two-acre grazing pasture for horses. Ride the park trails or ride the Amish countryside. Located in the corner of Knox, Richland and Ashland Counties makes many destinations within a short drive including: Mohican & Malabar Farm State Parks, Clear Fork and Snow Trails Ski Resorts, award winning golf courses, bike paths, Kenyon College and Mt. Vernon Nazarene & Ashland Universities. Testimonial: Thank you so much for letting us stay at your wonderful house! Things we really liked – Good Beds! With big windows, too! Large common space with a large dining table! Love the porches and Yoder’s Martin (Bird) Houses! Peaceful and quiet! Yard and flowers! AWESOME VIEW!!! We want to come back. Pre-book us for next year!